Τhe Cyprus Project Management Society (CPMS), as the national member association of the IPMA in Cyprus, is proud to present for the first time in Cyprus the prestigious project management courses and certification of the IPMA. The IPMA Level D Training is implemented in cooperation with the University of Nicosia. The first session will take place between the 9th and the 12th of June. The course is for experienced project managers wishing to undertake an internationally recognized project management certification. Also, business managers and professionals, from all industries, wishing to sharpen their project management skills can take part. The course is the preparation for the first-level of the IPMA Level D Certification program, “Junior Project Manager – Level D”. It will offer delegates the required project management knowledge and skills required in order to pass the IPMA exam. 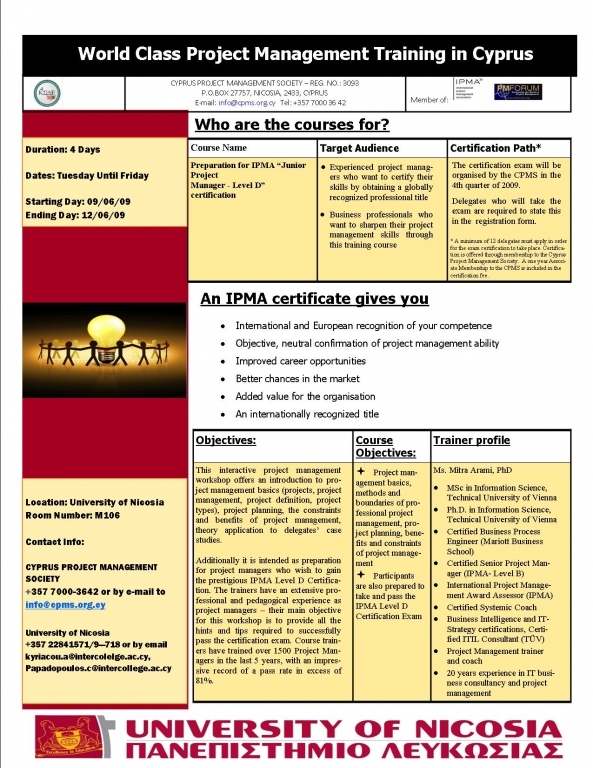 The course is offered in collaboration with the respective IPMA’s Austrian national project management association. The IPMA Level D certification programme is a global certification, widely recognized and accredited as a professional qualification in the E.U. (Austria, Denmark, Finland, France, Germany, Greece, Ireland, Italy, the Netherlands, Norway, Spain, the U.K.) by the business community, national education and professional bodies. Certification Path: CPMS will organise the certification exam in the 4th quarter of 2009. Delegates who will take the exam, have to state this in the registration form. PM Austria is the national association of the IPMA in Austria. The PMA certification certifies junior project managers, project managers and senior project managers and PM executives according to the validation system of the IPMA. The Cyprus Project Management Society (www.cpms.org.cy) is a non-profit organization and it is the national association of the IPMA in Cyprus. The objective of the Society is to promote international project management standards and techniques in Cyprus. It also introduces the benefits from the application of a project management culture in companies and the society in general. The University of Nicosia (www.unic.ac.cy) is the largest private university in Cyprus, with campuses based in the three largest cities in Cyprus: Nicosia, Limassol and Larnaca. The University of Nicosia is an independent, co-educational, equal opportunity tertiary education institution, which combines the best elements in western education; quality standards and an international philosophy. The International Project Management Association (www.ipma.ch) is aEuropean association based in Switzerland and it encompasses 46 national project management associations and 40.000 professional members around the world. The IPMA actively promotes project management to businesses and organisations globally and certifies professional project managers. It, also, awards successful project teams and researchers. Membership to the IPMA is available only through its national member associations. The respective association in Cyprus is the Cyprus Project Management Society. More information can be found in the attached leaflet or by contacting directly the CPMS. Individuals interested to participate can download the registration form registration form and follow the instructions on how to complete and submit the form. Registration deadline is the 4th of May.